Roger Fenton (1819 -1869) was a British photographer who undertook the first significant photographic coverage of war. 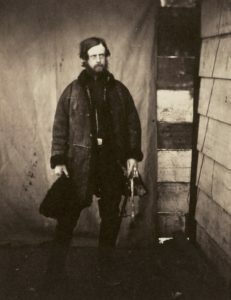 Commissioned by the printseller Thomas Agnew and Son to photograph the theatre of war in Crimea, Fenton arrived in Balakava with his assistant Marcus Sparling. Bearing in mind the camera technology available at the time, I was still intrigued to read about the equipment used: A “Photographic Van” comprising of a darkroom, 700 glass plates, chemicals, rations, harnesses, tools and four horses! Taking the opportunity to produce a body of work which represented the livelihoods of the people encountered. Fenton masterfully captured the faces less familiar to the Victorian public, such as Croats and Tartars, for the first time..
Of all these images, the image which stood-out is a portrait of Lord Balgonie. The eldest son of the 8th Earl of Leven, Lord Balgonie served in the Grenadier Guards during the war. The portrait concerned shows him appearing a little disengaged; and is considered to be the first portrait of someone suffering from “Shell Shock”. The photographs of Roger Fenton are not only a haunting representation of the people who were there; but a representation of the often chaotic and poorly managed campaign. Although most of the images were taken by Roger Fenton, I came across one image by William Edward Kilburn. I found his portrait of Florence Nightingale captivating, if only because I had so frequently heard the name, but rarely seen any photograph of her. If anyone has an interest in learning about the social impact of photography, then I would certainly recommend learning more about the work of Roger Fenton. The new year has arrived. © Timothy C Aikman 2018.